M4A audio file format is extremely popular among those who are fond of downloading their favorite songs and music from the internet. The A at the end of the name of the file format signifies that this format is specialized for audio files only. An advantage of using M4A format is that, unlike MP3 format, it does not require any payment of fees or licenses for downloading and distributing the audio file. It also takes up less space compared to the MP3 format on the hard disk for storing files of comparable quality. However, people may also look for ways to convert M4A to MP3 because of the number of platforms and devices that support the latter format. The MP3 format is the most widely preferred audio file format across all the major platforms and audio playing devices. Thus, M4A to MP3 conversion may become necessary for those who are fond of listening to the songs on their mobile MP3 players and if devices do not support the M4A format. Aimersoft Video Converter Ultimate is extremely versatile file conversion software that can work efficiently as a M4A to MP3 converter. The usability of any audio or video file format conversion software depends upon the number of file formats it compatible with. Larger the number of file formats it is compatible with and can convert, greater is the usability of that converter. Aimersoft Video Converter Ultimate is such an example. You can choose from over 50 different formats for their audio and video files, which include M4A to MP3 conversion. This M4A converter is easy to negotiate and can finish converting the files only with 3 simple steps. Just download it now and follow the tutorial below to experience how easy and fast it is to convert audio/video file format. For Mac users, please turn to Aimersoft Video Converter for Mac. Download the proper version of M4A audio converter and install it in your computer. Aimersoft Video Converter Ultimate is well compatible with Windows (Windows 8 included). The screenshots below are taken from the Windows version of this program. Run this software and click the Add Files button on top to import the M4A files to be converted. You can also load the files by directly drag and drop them into the main window of this program. Note that batch conversion is supported, so you can add multiple files at a time. In this step, please designate MP3 as the output format. This format is located in the Audio category of Output Format option. 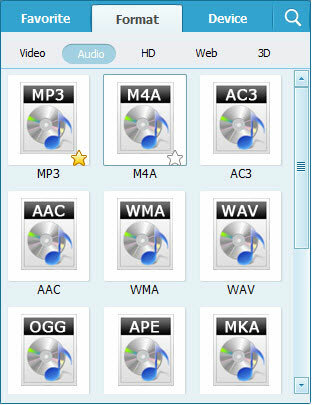 As you can see, transferring M4A to other audio format like AC3, MKA, WAV, AIFF, etc. is also possible by using this program. When all settings are done, simply click Convert button to begin the conversion. You will get your M4A converted to MP3 file format done in a few minutes. Easy as ABC, right? Try it yourself now.